Dustin Poirier vs Bobby Green at UFC 199 on June 4th, 2016. Poirier wins via 1st Round KO. Dustin Poirier has a professional record of 22-5-1. In fights that he wins, he finishes his opponent 77% of the time. 10 of those wins coming via KO and 7 via submission. In fights that he losses, 2 are from KO/TKO, 2 decisions, and 1 submission. Bobby Green has a professional record of 24-8-1. In fights that he wins, he finishes his opponent 71% of the time. 9 wins coming via submission and 8 via KO/TKO. In fights that he loses, 4 are decisions, 2 KO?TKO and 2 submissions. 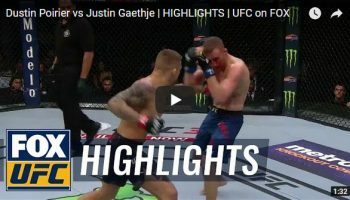 Dustin Poirier is scheduled to fight Justin Gathje at UFC on FOX 29 on April 14th, 2018.